The first day of Bangla New Year, Pahela Baishakh stands before us like the first blank page of the first chapter of a 365-page book waiting to be written. It's the day to dust away the forgotten memories and remnants of the past year and welcome the new dawn of a new year. Today, Bengalis irrespective of their religious and regional differences will be in a festive mood to celebrate life with pomp, fanfare and self-indulgence. The first day of every Bangla New Year takes us back to our childhood years when fantasy and fact intertwined. This day lifts us above in the sky of our imagination to peer into a dreamy brighter future. Today is a new opening, a new anticipation, filled with peace and happiness. People attire themselves with traditional costumes on this day. Women wear white sari with red border, their hair all bedecked in flowers. They will jingle out sweet music with colourful bangles on their hands to captivate onlookers around. Men wear their traditional panjabi with pajama or lungi. The day begins in Dhaka before the break of dawn when crowds gather in Ramna Park under a banyan tree or on the bank of a lake in Ashulia to witness the sunrise. Artists present songs to usher in the new year, particularly with Rabindranath Tagore's "esho he Baishakh" (Come, O Baishakh, Come, Come). This Baishakh-welcoming song would stir the listeners to reach out to the poetic mood that once inspired Tagore to compose this signature song where he asked nature to bestow fresh air, like the breath of a sage, to let all sorrows be swept away, to erase all disappointments and to let the earth be blazed and sanctified once again. 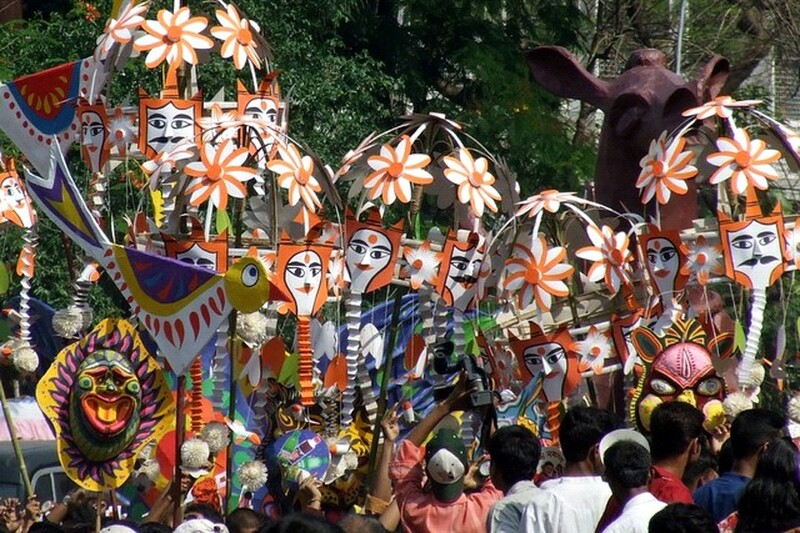 Among festivals that attract huge crowds in Bangladesh are Mongol Shova Jatra (Boishakhi Parade), Boishakhi Mela (Boishakhi fair), Aalpona (traditional designs drawn using bright colours on yards and staircases), Haalkhata (ritual closing of the old ledger and opening of a new one), boat race etc. Townspeople start the day with the traditional breakfast of Panta Bhat (rice soaked in water), green chillies, onion, and fried Hilsha fish to mimic the lifestyle of rural peasants. In rural Bangladesh, homes are thoroughly cleaned and people, however poor, dress in their best finery. Like other festivals, the day is also marked by visiting relatives, friends and neighbours, and special foods are prepared to entertain guests. On this day, with a storm (called Kalboishakhi) brewing over the dark horizons, we will try to banish our worries, write off our mistakes and redeem the coupons of blessings to make life worth living. New questions would be asked today, new answers should be discovered. A quiet interlude would be carved in our lives to give birth to welcome changes on this transformative day of delight and self-discovery. Today, a national holiday, is the day to let in fresh air to our homes and hearts, and change the water in our flower vases. It's the day to hit the Refresh Button.